Local property developer Roger Lucas’ appreciation of European architecture is the inspiration behind a unique residential development that is currently being constructed in Grandville. 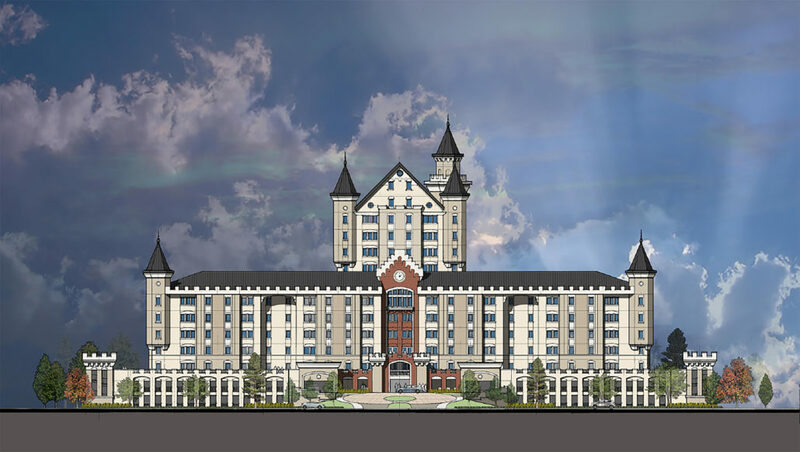 Lucas, co-owner of Land & Co, and sole owner of the entity building the development, The Grand Castle, LLC, is overseeing construction of The Grand Castle, a 400-unit residential apartment community on 23 acres of land at 2655 Grand Castle Boulevard in Grandville. The primary structure will be an impressive 15-story tower, surrounded by a perimeter of carriage-style apartments that will overlook a 1-acre courtyard. The Grand Castle will fill more than 1 million square feet, ranking it as the second largest castle structure in the world. The vision for The Grand Castle came from a combination of Lucas’ appreciation for the timeless beauty of classic architecture with his over 40 years of experience in residential development, which includes over 6,000 apartment homes in the region. The family has visited Germany extensively over the years and fell in love with the architecture of various castles, primarily Neuschwanstein Castle in southwest Bavaria, Germany. That nineteenth-century Romanesque Revival palace has served as the inspiration for The Grand Castle concept and experience. The complex, which also includes a two-story parking garage, will offer a variety of living arrangements, from 1-bedroom/1-bathroom units up to multifloor 3-bedroom/2-bath penthouse suites. Rent is expected to range from $915-$1,160 for 1-bedrooms, $1,380-$1,585 for 2-bedrooms, and $1,650-$1,740 for 3-bedrooms, with 1-bedroom, 2-bedroom, and 3-bedroom penthouses ranging from $1,425-$3,000. More than 64,000 SF of commercial space will also be available near the front of the property as part of a public plaza that aims to connect to the emerging downtown Grandville corridor. Construction, which is being handled by Land & Co. crews, started in April and is expected to be completed by summer of next year. The complex is quickly taking shape, due to Land & Co’s use of pre-fabricated concrete forms. Lucas and the entire The Grand Castle team are striving to make this development a destination apartment community; a place that residents seek out, strive to live at, and stay for not only one or two years, but an apartment community that they call home. The project has received all City of Grandville approvals and has been lauded as being a spark plug for additional mixed use growth in that corridor. And potential residents are also taking note. A website for the project can be found at www.grandcastle.com. In the meantime, interested parties should contact Jennifer Smith, Marketing Director, at jsmith@land-co.com or by phone at 616-318-6905.